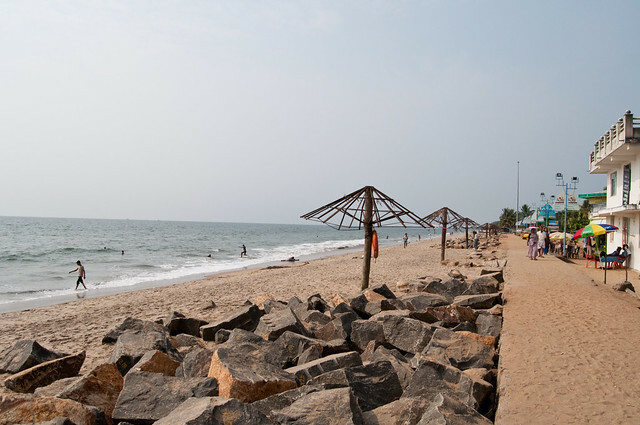 Located 45 km away from the Ernakulam city, the lovely Cherai beach is perfect for a relaxed beach holiday. The beach is quite unique in itself with thick coconut groves and Chinese fishing nets giving it a distinct character. Besides, the Cherai beach borders the Vypeen Island that can also be accessed by boat from Ernakulam. The Cherai beach is excellent for swimming and hence draws many people who just love splashing about in the warm water. There are also occasional dolphin sightings at the Cherai beach and if you are lucky you might be able to spot some of these playful mammals frolicking about in the water. Our Cherai Beach tours also give you an opportunity to explore the Bolghatty Island located nearby, which again is famous for its palace of the same name. The 10 km long Cherai beach is also a great place to indulge in rejuvenating walks or just laze around in the sun. An evening on this beach can be a delightful affair with numerous high mask lamps lighting up the main beachfront. As you enjoy your Cherai beach tour, indulge in a water scooter/boat ride or dig into some of the delicious seafood Cherai generously offers to its visitors. Our Cherai beach tours offer you the perfect opportunity to indulge in a vacation wherein you can simply put up your feet and relax. This rejuvenating experience would surely go a long way in ensuring a wonderful Kerala vacation for you. The best way to reach Cherai is to take a ferry from Cochin to Vypin. The ride takes less than 10 minutes. Once you get off at Vypin boat Jetty, take a bus to Cherai. Buses are frequent and they usually take less than an hour to reach Cherai. The alternative route is to get to North Paravur through Edappally. The next 6 kilometers from North Paravur to Cherai can be covered by 15 minutes or so by a car. The total distance of this journey is about 25 Kilometers. This is the route to take, if you are heading directly from Cochin Airport to Cherai.